What's The Difference Between Standard White & Double Shuttle? One of the main characteristics of the woven labels is that they are built from threads, which are woven together to form the label. Depending on the type of woven method used, the colors of these threads will shift the other ones, ie making a white not a pure white but a “tinted” white, where the color of this tint is the color of the secondary color used in the woven process. like in the picture on the left, where the purple shifts the color of the light blue, making it a darker more muted blue. Click on the picture to see a larger picture. Our Customer (Simply Tall) wanted a white background, but color shifting occurs with light-colored backgrounds. 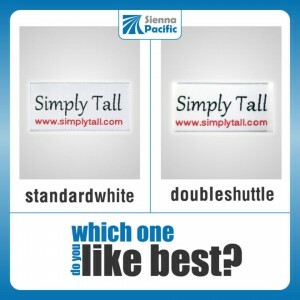 Did they choose the standard white or the double shuttle (pure white) background? Oh colors, colors, they are always an interesting piece on the manufacturing puzzle. It is hard to choose colors. That’s why we offer a color-version comparison to our customers, FREE of Charge. If you have difficulty picking between two thread colors, just let us know and we will create two versions of your woven labels, it will hopefully help your decision-making a little easier. Does the pure white make it nicer? Or is the slightly grayish colored background ok?